I am a Jesus loving, Baby Wearing, Mother of 4 very special kids! With a knack for sewing and creating beautiful and unique things. I’ve always been an entrepreneur at heart, and decided to merge my gifts and passions and this is where I ended up. 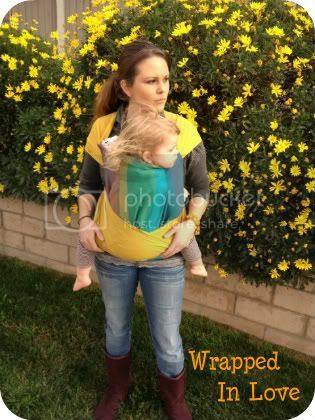 I specialize is Custom Made Baby Carriers that have a sense of style, and personal touch…While maintaining superior comfort and safety! Life is Busy in our household…I admittedly do not have the fastest turn around for my custom orders, However I am working very hard to better myself and my turnaround times. Every carrier is completed by me! I do have a few employee’s that help me with packing, and some light sewing on occasion, but not often. I guess you can count the 2 short people running around the “office” getting into mischief quite often! I’ve actually taught my 3 year old how to hold the tape measure for mommy….and she’s gotten pretty good at it actually. She demands to be paid in Chocolate, and I have reluctantly obliged. I am so blessed to have my mother helping me with my company! She picks up the slack wherever it is needed, and wears many hats around here. Whether it's helping with the kids, packing up orders, answering e-mails, taking product shots or even cooking dinner while I sew. She is invaluable! And I am so blessed to have her!